Green greetings and joy to you. 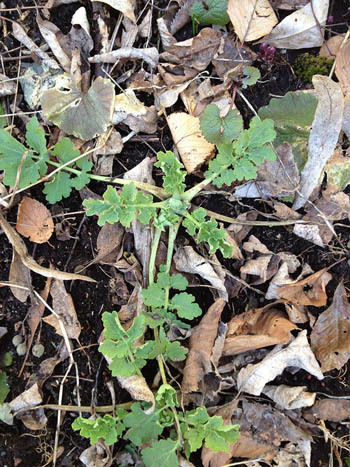 Are you ready for our first weed walk of the year? Yes, indeedy, spring is sprung and the green is gaining ground each day. It's time to go out and renew your friendships with the plants that live with you. If you had a specific green ally last year, say hello to that plant first. Breathe with that plant for several minutes. Then let your eyes and feet wander to new faces, familiar faces, the same old faces in different places. This is a special time of the year, for so much that will be hidden by summer's rampant growth lies revealed to us. In the few weeks between the melting of the snow and the coming of the leaves, the land's secrets are there to see for those who are looking. Putting my bare feet on the feet and breathing in the breath of the plants is the best I know to start my day. No matter where I am, the earth is beneath my feet. No matter where I am, the air I breathe is a gift to me from the plants. My life is gift after gift. The Wise Woman Center begins the 2014 season with our Easter work-exchange weekend. Who knows what treats the bunny will leave for hard workers? This is also the orientation weekend for a great new group of live-out apprentices. The first of the new live-in apprentices will be here as well. And we're likely to have new baby goats. You are invited to come and help us get ready for the first workshops of the year. And do join me for Spring Tonics on Saturday April 26 and Hands-on Spring Medicines on Sunday April 27. There is still room and still time to register for these fun workshops. Saturday we'll take the path to the wild leek patch and learn the story of The Women Who Loved Ramps. We will bite buds, sniff shoots, and discover all sorts of spring treasures. Sunday we'll harvest young nettle tops and make the first nettle soup of the year, then gather a multitude of greens for a lush wild salad, and, after lunch, make a spring remedy or two. Reserve your place here. 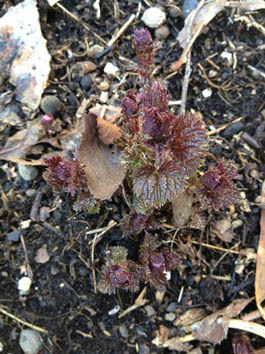 And now for that early spring weed walk I promised you. Let's go! 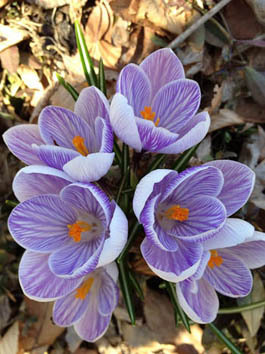 Here is a bouquet of crocuses for you. 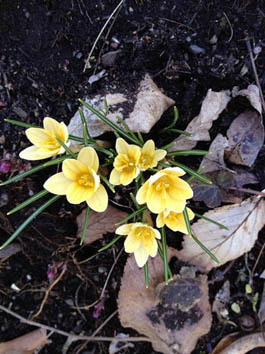 After the deep, cold winter, the spring bulbs are producing record amounts of blooms. Every day is a feast for the eyes and the bees. There were hundreds of honeybees buzzing in the crocuses and snowdrops when I took photos for this week's ezine. 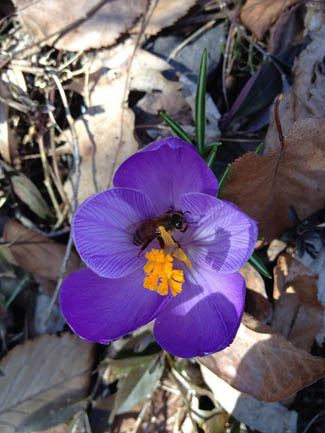 I managed to catch one of the bees in one of the crocus . . . or did she go home and say: "I got her to take my picture and put it up on the Internet." Saffron is edible, and it is part of a crocus. It is, in fact, the female part (the orangey-yellow bit in the center of the flower). 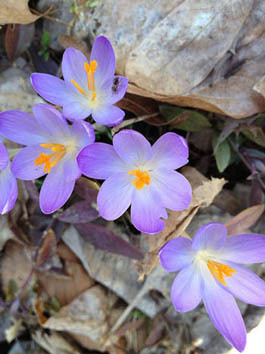 Not of these crocuses though; saffron is from a crocus that blooms in the autumn. Saffron is edible in minute quantities only. 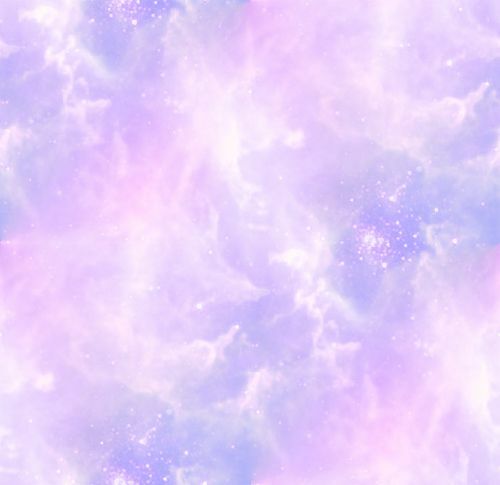 Too much can supposedly precipitate a miscarriage, as well as cause symptoms of poisoning. That's scary to me, since flowers are the least likely place for a plant to put its poisons, I have never ventured to eat my crocuses. Though I suspect a few petals in my salad wouldn't kill me, though eating the bulb might. Crocuses, like most of the flowering bulbs of spring, are members of the lily family, which contains some violently poisonous plants, like daffodils, as well as deliciously edible plants, like leeks. She has been waiting, under the snow, this evergreen member of the poppy family. And here she is, a bit flattened, but ready to grab some rays and get up and grow. This early in the year, her cancer-caustic sap is weak and not much use. We will watch her grow for some weeks yet, absorbing the lengthening hours of light, and return when she is at her strength. And that will be soon indeed. This mint is also virtually evergreen. You can tell by how large the leaves are. 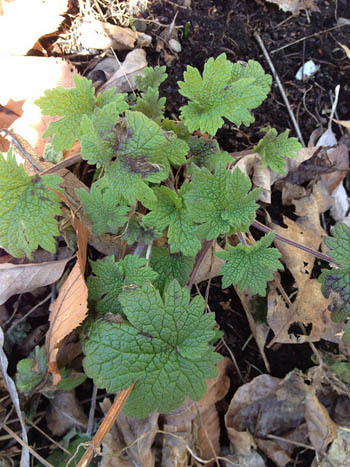 Compare the leaves of the celandine and the motherwort to the leaves of the nettle, which goes completely underground for the cold months. They are big, while the nettle leaves are tiny. Take a good look at this motherwort so you won't weed her from your garden by mistake. It is still several months before we will make medicine with motherwort. She needs to gather her resources and summon her spirit before she covers herself with flowers and seeds packed together in a medicine wheel. 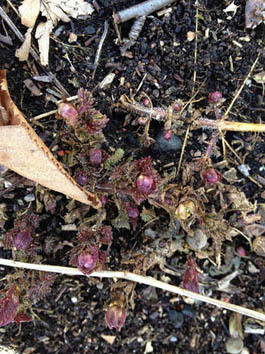 Look at the beautiful purple color of these emerging nettle shoots. I don't start harvesting the shoots to use in soup until they are dark green, another week or two from now. But if I were to make nettle tincture, which I don't do, I think I would make it now and see if I could capture some of her royal purple in my vodka. Purple nettle vodka, now that's a drink I could get excited about. Artemisia vulgaris, often called mugwort, but addressed as cronewort by me, is an invasive plant. Her ability to be pushy works well when she is colonizing roadsides and reclaiming parking lots, but not so well in my herb garden. Every spring I am faced anew with the necessity of containing my thriving cronewort patch. One of the ways cronewort invades and claims land is by forming an underground network of crisscrossing rhizomes and roots. To control cronewort, one must pull up as much a s possible of these roots. In the first photo you can clearly see that the roots are just starting to sprout their new leaves. 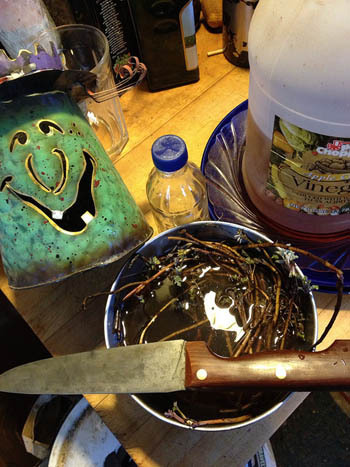 This vinegar can be made when the leaves are large as well. 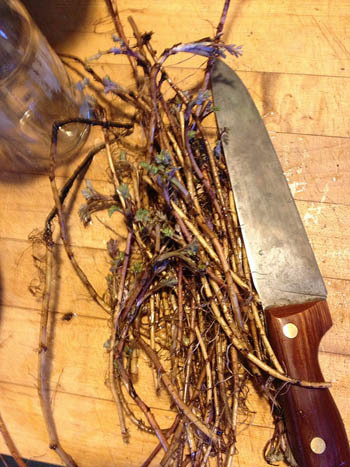 Put the rhizomes/roots and sprouting leaves in a bowl and cover with cold water and let soak while you gather: pasteurized apple cider vinegar, a sharp knife, a jar with a plastic lid, a label and a waterproof pen. When I have everything gathered, I swish the roots around in the water to free clinging dirt, then shake them dry in the sink, and chop them. Yes, you can rinse the roots under running water or even use a brush on them to get all the dirt off. But think of this: A little dirt in the vinegar will improve your gut flora. 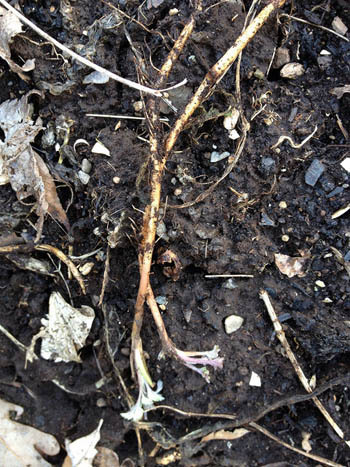 Soil bacteria improve the ability of the body to uptake and use minerals. Any dirt left on the roots will sink to the bottom of the vinegar, so you will not actually ingest it. 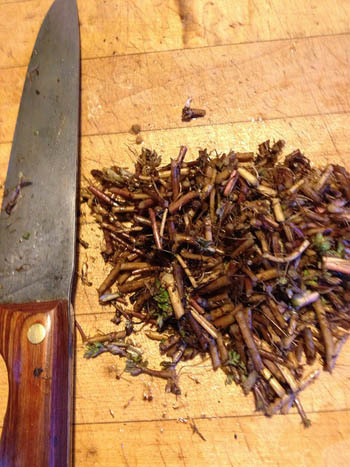 Keeping the roots parallel while soaking and afterwards makes cutting easier and more uniform. The most difficult part of making a vinegar is finding the right jar. It is best if it is filled right up to the top. If you are shy, go back outside and get some more plant material. A little care here will make a big difference in you finished product. 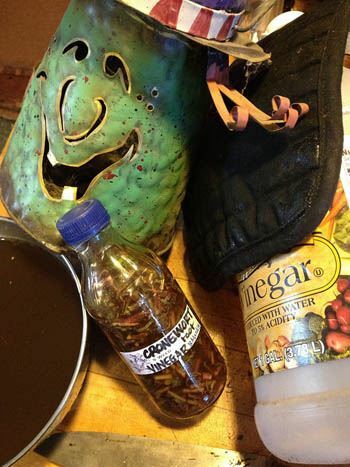 Be sure to use a plastic lid as the vinegar will corrode metal. Here is the finished vinegar. Well, not finished completely, since it takes about six weeks for the minerals in the roots to be fully extracted into the vinegar. So label your vinegar and find a place for it where you can observe it over the next month or so. I'll be asking you about it, so be sure to keep it near at hand.